Amongst recent contemporary art and museological publications, there have been relatively few which direct attention to the distinct contributions that twentieth and twenty-first century artists have made to gallery and museum interpretation practices. There are fewer still that recognise the pedagogic potential of interventionist artworks in galleries and museums. This book fills that gap and demonstrates how artists have been making curious but, none-the-less, useful contributions to museum education and curation for some time. Claire Robins investigates in depth the phenomenon of artists' interventions in museums and examines their pedagogic implications. She also brings to light and seeks to resolve many of the contradictions surrounding artists' interventions, where on the one hand contemporary artists have been accused of alienating audiences and, on the other, appear to have played a significant role in orchestrating positive developments to the way that learning is defined and configured in museums. She examines the disruptive and parodic strategies that artists have employed, and argues for that they can be understood as part of a move to re-establish the museum as a discursive forum. This valuable book will be essential reading for students and scholars of museum studies, as well as art and cultural studies. 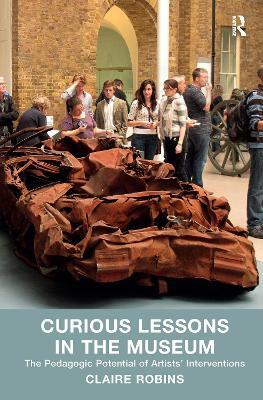 Buy Curious Lessons in the Museum by Claire Robins from Australia's Online Independent Bookstore, Boomerang Books. Claire Robins is a senior lecturer in Art, Design and Museology at the UCL Institute of Education, University College London,UK.